Back in October 2011, I did post about the YouTube ghost story contest for all the fans in the UK. The winning story, fear of hue by Nicky Torch, is read by Daniel and will featured on the DVD/Blu-ray & digital download. The video is released today by the official The Woman in Black UK. Facebook page. 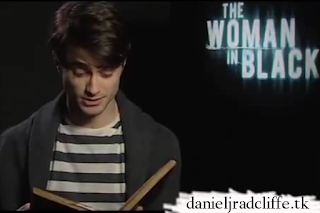 To celebrate the DVD, Blu-Ray and Digital Download release of THE WOMAN IN BLACK, on Monday June 18th, Daniel Radcliffe, star of the thrilling ghost story, today released a video of himself across YouTube and Facebook reading the winning haunting tale from last year’s THE WOMAN IN BLACK YouTube ghost story competition. The competition was a resounding success with 177 harrowing, spooky stories submitted that were whittled down to ten finalists. Fans were encouraged to vote for their favourite story from 21st December to January 5th, 2012 in what was a fiercely competitive contest. Budding young writer Nicky Torch, 16 from Lancashire beat 177 other haunting and harrowing tales to become the winning entry with her story ‘Fear of Hue’. Nicky’s prize for winning the competition was to attend the world premiere of The Woman in Black and to have her story read out by Daniel Radcliffe on the DVD, Blu-ray and Digital Download release of the film.